Just one part of the Brain Farm filming system. Yes, that's a truck with snow tracks on it. It drives down the pipe. 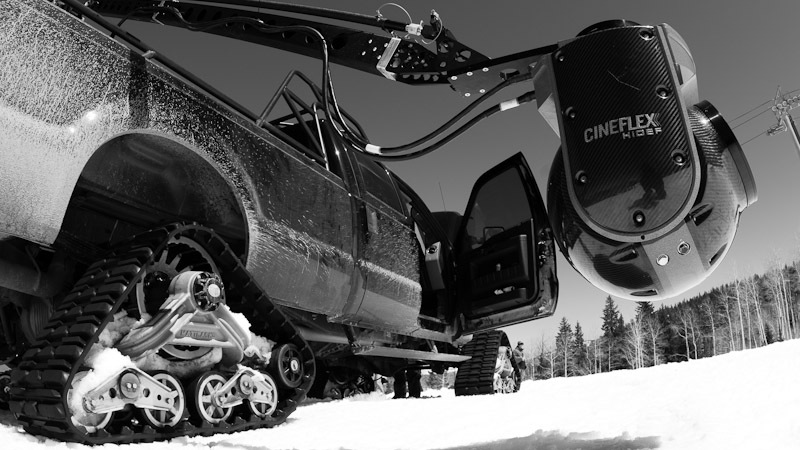 Travis Rice and the Brain Farm crew have emerged from the deep backcountry and taken over a now-closed mountain in Aspen, Colo. for a private park and pipe shoot this week. This is the second to last filming segment for the two-year movie project "The Art of Flight" (watch movie trailer here), which will make its long-anticipated debut this September. Though Rice has been filming steadily with Mark Landvik, Scotty Lago, John Jackson, Nicolas MÜller, Gigi RÜf, Jake Blauvelt, Jeremy Jones and DCP for this project, only two of the usual suspects are here in Aspen. Landvik is here to provide comic relief, as he blew out his knee on the same jump that took out Lago's jaw in January and is still recovering from knee-surgery. Lago is here, with a fully functioning jaw, and he brought along his Frends. For the past five days the many high-tech, next-level technology film cameras have been trained on Lago, Danny Davis, and Jack and Luke Mitrani. The boys have been ripping hundreds of laps through the halfpipe, pausing at the top to get trick advice from team leader Kevin Pearce, who's here to provide moral support, while Seb Toutant, Mark McMorris and Eric Willett play snowboard P.I.G. at the bottom of the pipe, waiting for the shoot to move up the hill to kicker land. 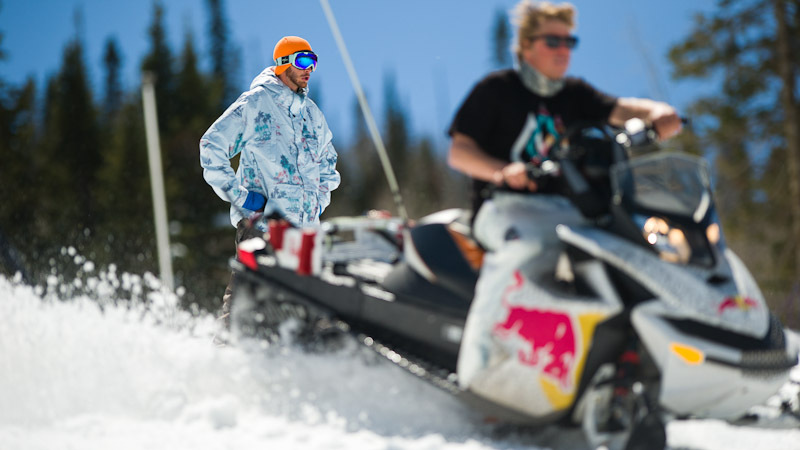 Scott (there's a movement afoot to drop the "y") Lago and Travis Rice. Today the helicopter is coming. Tomorrow the triple-cork mafia will join Rice on a kicker that the Aspen park crew says is 90 feet, but the riders swear is "only 60-70." Whatever the size, it's got a poppy lip and yesterday Toutant pulled a slow, tester double cork 1260, and proclaimed that it was definitely big enough to do any trick imaginable. Asked why he'd assembled this particular crew for this shoot, Rice waved towards Davis, Lago and Mitrani -- who cracked ten jokes, half of which were delivered in rhyme, in the amount of time it took to gather this quote -- and said, "How could you not want these guys around? They're just fun to ride with." Though the Frends crew was only scheduled to be on this particular shoot until today, Rice and Lago asked them to stay through to the end so they can try their hand at hitting what has been dubbed "the gumdrop village" further up the hill. As to the Toutant, McMorris, Willett kicker-kid combo, Rice, who has been trading double and triple cork tips with Toutant in the evening, replied simply, "We want to film the best, most progressive tricks possible on this jump. They're the best." Today the helicopter arrives in Aspen. Tomorrow the shoot moves from the pipe up the hill to the kicker. We'll keep you posted on any new trick developments as they unfold.